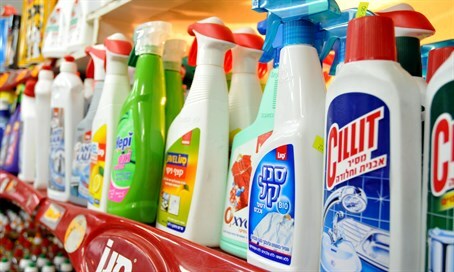 Magen David Adom issues the full guide for safety whilst cleaning and preparing for Passover. Every year, Magen David Adom (MDA) teams treat injuries that occur during cleaning and preparation for the Passover holiday. In 2015, MDA paramedics treated 2 children for chemical burns caused by cleaning supplies, and a 40-year-old woman died after she fell from her balcony while she was cleaning windows. The greatest exposure to the materials is whilst cleaning and the skin contacts the material, as well as inhalation of poisonous vapors. The poisonous materials are likely to penetrate our bodies and to cause damage even days and hours after exposure. Remove the cleaning materials from reach of children, clearly write and mark the packaging stating that it is cleaning material and not food. Make sure to leave the remains of the cleaning materials and medicines in their original packaging. Whilst cleaning remove food away from the cleaning materials. Make sure to wear closed shoes whilst cleaning the house. Thus you will avoid slipping and getting burns from the cleaning materials on the soles of your feet. Babies tend to put everything into their mouths, often remains of cleaning materials are left all over the house. Make sure to wash the floors well and remove the materials. Pregnant women and those breast feeding should avoid being exposed to chemical, poisonous materials. Read the instructions on the package, and make sure that the item is friendly for use and for the surroundings. Make sure not to mix different types of cleaning materials. Open the windows and air the house after cleaning. In the case of poisoning – dial 101 and call for an ambulance. It is strictly forbidden to give any "antidote", do not give milk or lemon juice to drink. Causing a person to vomit is dangerous for the victim. Make sure the airways are open and place the patient in a position that is comfortable for him. In cases where the eyes are affected – wash out the eyes well with flowing water only, do not rub them! If the irritation, redness and tears continue, dial 101 and call for an ambulance. Chemical burn injuries to the body – read the instructions on the packaging, dial 101 and call for an ambulance. Allergy – In case of slight allergy or local sensitivity wash the area with water only and act according to the instructions on the packaging. In cases when the sensitivity increases as shown by breathing difficulties or swelling, dial 101 and call for an ambulance. At the same time, sit the victim down. Whilst baking, cooking and burning the Chametz – move the children away, watch over them and instruct them to keep away from sources of heat. Remove hot objects from places reachable by children (kettles, water heaters, baking trays etc.). Whilst burning the Chametz – move the children away and make sure that the fire is under control. First of all, dial 101 and call for an ambulance! If the victim is on fire, roll him in the sand/dust, pour water on him, cover him with a wet blanket (do not cover his head for fear of suffocation). With localized burns – place the injured limb under lukewarm flowing water only, and calm the patient down.